A deer-leg roast is a substantial piece of meat that can feed 10 to 12 people on average. Deer legs are most tender from a young deer. As a deer ages, the muscle becomes tougher and is difficult to cook and eat. 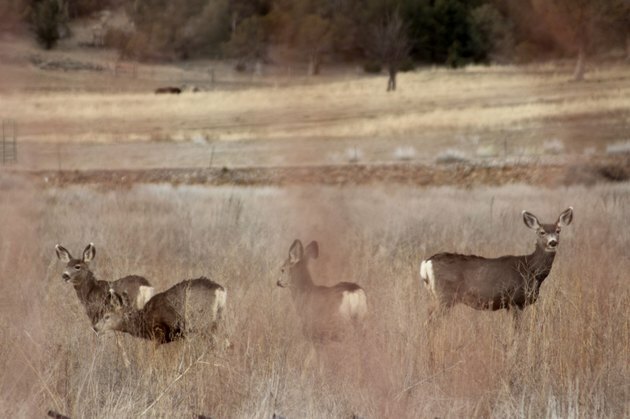 Deer meat is low in fat and calories, offering a heart-healthy alternative to beef. Deer legs should be cooked to a maximum of 126 degrees Fahrenheit on a food thermometer. According to "Field & Stream," this is the temperature when the meat reaches medium-rare doneness. Since it will continue cooking after removing it from the oven, this temperature ensures it will not overcook and dry out. Create a rub for the deer leg using dried herbs and spices, minced garlic and olive oil. Mix 1/2 cup of each spice with 1/4 to 1/2 cup of olive oil. You need to make a paste-like mixture that is just thin enough to spread. Rub the spice mixture all over the deer leg. Wrap the leg in plastic wrap and refrigerate it overnight to allow the flavors to marinate into the meat. Drizzle the deer leg with olive oil and place it into a roasting pan on a rack. Roast the deer leg for one hour. Baste the deer leg using 2 cups of simmering beef or venison stock. Turn the deer leg over and continue to roast it for another hour. Turn the roast again and baste it with the remainder of the stock. Roast it for an additional 15 minutes. Check the internal temperature. If it is at least 126 degrees Fahrenheit, the deer leg is done and can be removed from the oven. If not, continue to roast it in 15-minute increments until you achieve the proper temperature.